Kitchen wardrobe, excellent as much as the kitchen 216 cm, for all SUPERIOR accommodation facilities with breakfast zone. A kitchen wardrobe that is perfect for tourist lodgings. Product Overview The whole structure of the kitchen is made of plywood, internal shelves, the doors of the fridge column, the worktop base and the shutter. One of the peculiarities of our furniture is its long-life. It�s also possible to customize it with any colour and variation. Complete with: fridge/freezer of 150 liters placeable inside the column or under the worktop, washing machine and oven of 60cm (on demand), steel plate-rack, one sink with steel drip, hob with two gas/electric hotplates, filtering and suction hood, extractable mixer tap, steel tool holder, steel double-wall H.50cm (optional recommended). Wonderful, an entire kitchen made of wood, with household appliances and quality accessories. Some optional on demand: steel double-wall h.40cm, inox microwave, steel swing litter bin, roll holder, lighting down the cupboards with or without plug. 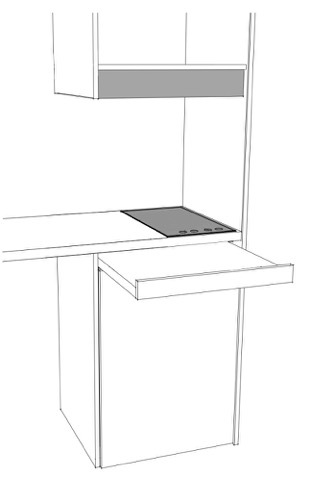 with a sink and a drip tray, placed on the right or left, a shower mixer with removable shaft tool holder in steel, including the hangers, a filter hood / cupboard, with a drainer tray removable water collection, both in steel, one shelf high, located above the hood, a fridge to 230lt with a freezing cellar.